There’s nothing like standing on your patio, grilling a few burgers, and enjoying the warm summer air. However, if you have a propane grill, what was originally a peaceful, summer evening could turn into a disaster if you don’t take certain precautions. At Northwest Propane, we recommend following several basic safety guidelines every time you get out your grill to cook. Follow the instructions. Before you clean, assemble, or store your grill, make sure that you always refer back to the manufacturer’s instructions. Keep your grill in a safe place. If kept in the wrong place, your propane grill could become a fire hazard. 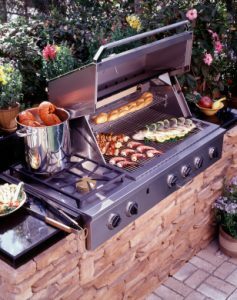 When you are looking or a place to position the grill, make sure that the spot is at least five feet away from your house and clear from overhead trees, patio furniture, and other potentially flammable items. Light it right. When you’re lighting your grill, follow the manufacturer’s instructions. Always make sure that the lid is open and that you don’t lean over the grates during this process. Use proper relighting procedures. If your flame goes out, turn off your grill and refer back to your manufacturer’s instructions for guidance. For most grills, you should keep the lid open and wait about 15 minutes before starting the relighting process. Additionally, never leave your grill unattended. While you’re cooking, don’t stray more than a few feet away from your grill and pay close attention to your food’s progress. If you have questions about proper propane safety this summer, we would be more than happy to provide you with the information you’ve been looking for. You can contact us at Northwest Propane today by calling 800-274-6121.